Verdict comes as Jews, Roma, face rising discrimination and attacks in the EU-member state. Four Hungarian far-right extremists were sentenced to jail Tuesday over the killings of six members of the Roma minority, including a child, in a wave of racist attacks using guns, grenades and Molotov cocktails. A Budapest court sentenced brothers Arpad Kiss and Istvan Kiss and Zsolt Peto to life for the killing spree between 2008 and 2009, while their driver Istvan Csontos received 13 years as an accomplice. The four men, who hatched their plans in a pub in Debrecen in northeast Hungary, are hard-core football fans with neo-Nazi links. They showed no emotion as the verdicts were handed down, according to AFP. The gang killed six people and left another five seriously injured, all ethnic Roma, in a 14-month reign of terror that shocked Hungary. Demonstrators gathered outside the court for the verdict vented their rage at the men, shouting "Nazi killers!" Starting in July 2008, the Kiss brothers and Peto, driven by Csontos, carried out nine brazen night-time assaults on Roma living in villages in northeastern and central Hungary. In one of the most gruesome attacks, a Roma father and his five-year-old son were gunned down as they tried to flee their house, which the gang had set on fire. In another incident, a woman was shot in her sleep. The gang's motive was to provoke a violent reaction from the Roma and spark inter-ethnic conflict, prosecutors said. The Hungarian police have been accused by the victims' relatives of being slow to investigate the killings, refusing for a long time to see any link or racial motive. After one of the attacks officers failed to cordon off the crime scene for 12 hours, attorneys for the relatives say. Three innocent young Roma spent almost a year in custody on suspicion of involvement. Police security was heavy inside and outside the court building for the verdict, which ends a two-and-a-half year trial and comes a few days after the fourth anniversary of the last attack on August 2, 2009. All four gang members, in custody since their arrests that month, admitted involvement in the attacks but pleaded not guilty to murder. Defense lawyer Zsolt Berdi said he intended to appeal. Hundreds of people gathered to hear the verdict, including several relatives of the victims, some wearing T-shirts bearing pictures of the victims. One T-shirt read: "Their skin-colour was their crime". "They wanted to start a civil war between Hungarians and Hungarian Roma. The charges should have been crimes against humanity, terrorism and racism," prominent Roma activist Aladar Horvath said. Plagued by poverty and high unemployment and often shunned by the rest of society, Hungary's Roma are often subjected to verbal and physical abuse. The community makes up between five and eight percent of Hungary's 10-million population. The Roma have also been physically targeted and harassed by far-right extremist groups and are regularly vilified as criminals by the far-right Jobbik party. 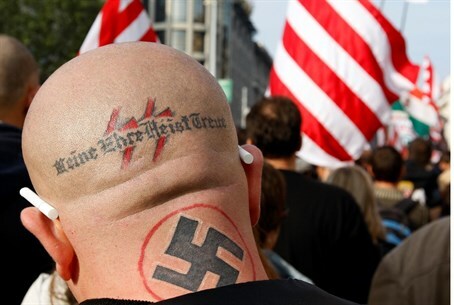 The Jobbik party - whose members commonly parade in Naziesque black shirts - is also notoriously antisemitic, and has been blamed for fueling rising antisemitism in Hungary. Last year, Jobbik MP Marton Gyongyosi demanded that the Hungarian government release a list of Jewish MPs and cabinet members who might be a "national security risk." Prime Minister Viktor Orban, leader of the Fidesz-Hungarian Civic Union party, and a controversial figure who detractors say is eroding democracy in the EU member state, has been accused of presiding over a rise in anti-Roma feeling and antisemitism. In January, Zsolt Bayer, a prominent journalist close to Orban, equated Roma to "animals" who "should not exist". His newspaper was later fined by the country's media regulator. Zoltan Balog, minister for human resources, said Tuesday the case was "not a question of minority or majority" but of "human dignity". "No perpetrators of racist crimes can escape the law in Hungary, and especially savage murderers pay a worthy penalty for their deeds," he said in a statement. Amnesty International said Tuesday that Roma in Hungary still face discrimination and violence and are demonised by the media and politicians. "Today's verdict is a positive step, but Hungary has yet to learn the lessons from these killings. The authorities are still not doing enough to prevent and respond to violence against Roma," it said in a statement.